Celiac Disease and Gluten: Multidisciplinary Challenges and Opportunities is a unique reference work—the first to integrate the insights of the causes and effects of celiac disease from the chemistry of reaction-causing foods to the diagnosis, pathogenesis, and symptoms that lead to proper diagnoses and treatment. With an estimated three million people in the United States alone affected by celiac disease, an autoimmune digestive disease, only five percent are properly diagnosed. Drawing on the connection between foods containing gluten and the resulting symptoms, this resource offers distinctive information that directly explores and links food science, medical diagnostics, and treatment information. 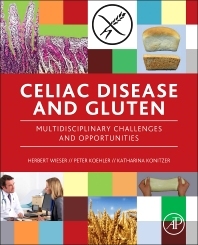 A helpful tool for researchers and medical practitioners alike, Celiac Disease and Gluten: Multidisciplinary Challenges and Opportunities helps refine research targets, and provides a comprehensive overview on the multidisciplinary approaches to all crucial aspects related to celiac disease. Medical practitioners and scientists, analytical and protein chemists, food technologists, nutritionists and dietitians involved in CD. Peter Koehler is currently chairman of the Working Group on Prolamin Analysis and Toxicity and scientific advisor of the German Celiac Society. His research on celiac disease is focused on gluten analysis and gluten detoxification by means of enzymes.